Info GARDNER, Cory, a Representative from Colorado; born in Yuma, Yuma County, Colorado, on August 22, 1974; B.A., Colorado State University, Fort Collins, Colo., 1997; J.D., University of Colorado, Boulder, Colo., 2001; agricultural advocate; staff, United States Senator Wayne Allard of Colorado, 2002-2005; member of the Colorado state house of representatives, 2005-2010; elected as a Republican to the One Hundred Twelfth Congress (January 3, 2011-present). 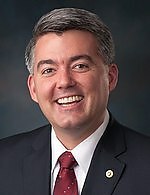 06/23/2020 CO US Senate - R Primary ?? ?